With built-in support for Skype (both voice and chat), Yahoo! Messenger, Google Talk and a peer-to-peer IM mode, the Mylo is easy to setup. And because it has a built-in web browser, you should be able to connect to WiFi networks in airports and hotels (I haven’t tried it). While the screen is way to small for professional browsing, it works quite well for the mobile email web interfaces. In addition, the mylo comes with music and video playback, as well as photo galleries. This device is also supposed to be able to share the content with other Mylo users… but as I only have one I know who has one, I didn’t try that. 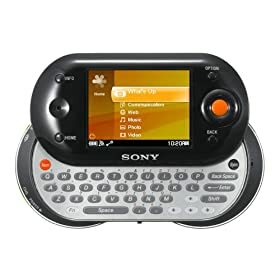 Being a Sony device, the software to manage the mylo is only available for Windows and it seems to try to encode the music in Sony’s ATRAC format. I guess you can also play unprotected MP3 songs as well as WMA file, but AAC support seems to be missing… not a big problem for me as the 1 Gb built-in memory is no replacement for my iPod. From a video front, the built-in player seems to work fine to play the demo movie, but when I tried to play a movie encoded for the PSP on a memory stick (yes, there is a slot for that on the Mylo), it didn’t accept either the format (this devices only supports MPEG4 files, not H.264) or the resolution (you cannot exceed QVGA). In addition, there is a built-in text editor which enables to quickly take notes on the go. But back to what this device is really about: Instant Messaging! And there, I have to say, even with my big fingers, typing is fast enough. It’s not as good as the Blackberry (or is it that I just got so used to that devices? ), but it works great to have quick chats with friends online. The “What’s Up” screen gives you a quick overview of who is online, independently of the IM client they use. My only complain (and I know I am not the only one) is that the Mylo does not (yet) support MSN and AOL… I am much more interested in the IM protocol from Microsoft than the latter one as that’s a place I have quite a few contacts… Sony, if Gaim and Adium can get this to work, why can’t you hook into the same libraries… especially as the Mylo is running Linux in the background anyway from what I’ve seen. Please, put this on your list for the next firmware update. And for the firmware after the one with MSN support, could you add a LocationFree TV client to the Mylo? Finally, outside of the way-to-high price point of this device, the one big negative I’ve noticed so far is battery life. If you leave the device on and connected to the WiFi network, battery life won’t last a day… and that’s without talking or chatting. I would have expected much better here… at least 24-48 hours “stand-by” time, e.g. device with the screen turned off, but connected to the network and into the IM accounts, with a talk time of 2-3 hours. One more thing: Sony Canada, why don’t you sell this device over here? Next Next post: Windows is the new “Classic” after all.